Capping the tax break, they say, would cause employers to offer skimpier benefits, and some would stop offering coverage altogether. That would erode the employer-sponsored health insurance market. But mentions of tax reform led by a GOP-controlled Congress has opponents gearing up for their biggest and potentially most expensive battle yet. Last week, a leaked draft of the House Republican bill to repeal the ACA showed lawmakers plan to cap the tax breaks on employer-sponsored health insurance to pay for the replacement healthcare law. It would be the single source of revenue to pay for the new age-based tax credits that would replace the ACA's subsidies. Capping the tax break is “not a policy that's good for workers and not a policy that's good for employers,” said James Gelfand, senior vice president of policy for the ERISA Industry Committee, a lobbying group for employee benefit issues. Capping the tax break, or even doing away with it entirely, is a favorite Republican tax reform strategy floated several times since the Reagan administration. Since World War II, both employers' and employees' contributions to the cost of health insurance have been excluded from federal income and payroll taxes. That's a major incentive for employers to provide insurance. But employers argue that taxing health benefits would require them to scale back on the benefits they offer, pass more costs onto employees, or even quit providing insurance altogether. If employers drop health benefits, the employer-sponsored market that provides coverage to 178 million Americans could lose its stability, opponents of the cap say. And while the proposal to cap the exclusion aims to hit overly generous health plans, plans with older workers or those in states with more expensive healthcare could exceed the threshold even if their health plans aren't generous, said James Klein, president of lobbying group American Benefits Council. On the other hand, health economists largely support limiting the tax break. As it stands, the unlimited subsidy gives consumers less reason to care about the cost of healthcare. Consumers with generous health benefits spend more and drive up healthcare costs, which leads to higher insurance costs in the long run, said Martin Gaynor, an economist at Carnegie Mellon University. Businesses see health benefits as a form of compensation. If those benefits are taxed and the value therefore reduced, then employees should see their wages rise, he said. Taxing something as essential as health insurance is an unsavory pill to swallow. But “it’s something that would lead us to ultimately a better healthcare system that is less expensive and beneficial to everybody,” he said. Some argue that employers’ concerns over the cap on the tax break are overblown. The House Republicans' leaked draft of its ACA replacement plan would limit the tax break to the 90th percentile of current group health insurance premiums. Benefits above that threshold would be taxed. A cap set at the 90th percentile would affect few employers, and so few would stop offering insurance, explained Erin Trish, a health policy professor at the University of Southern California. More likely, they’d tweak their health plans to keep below the tax threshold. A similar situation occurred when the Cadillac tax was looming over employers’ heads. Many observers were concerned that employers would drop coverage in anticipation of the tax, which was delayed, but that largely didn’t happen. Employers did, however, shift more workers to high deductible plans. Responding to the threat to the status quo, the American Benefits Council's Alliance to Fight the 40, a coalition of big employers, business groups and unions—including companies such as insurer Cigna Corp., Exxon Mobil and American Airlines—launched a campaign to lobby against proposals to limit the tax breaks on employer-provided insurance. The coalition was initially formed to fight the ACA's Cadillac tax—a widely loathed 40% excise tax on the value of employer-based health premiums that exceed specific thresholds. The Council of Insurance Agents & Brokers, a trade organization representing commercial insurance and employee benefits brokers, is also urging the Trump administration to preserve the tax-exempt status. The group spent $330,000 in the fourth quarter of 2016 to lobby Congress and the federal government on preserving the tax exclusion and nixing the Cadillac tax. Since last April, the lobbying group has spent $1 million on the issues, disclosures show. It's unclear where health insurers will throw their support. Insurers such as Cigna and the Blue Cross and Blue Shield Association fought the Cadillac tax, so it's likely they will support the fight against the cap. The two mechanisms both encourage employers to offer less generous coverage. The Cadillac tax hits the self-insured employer or the insurer, while the cap would directly affect employees enrolled in a health plan, however. The Alliance of Community Health Plans, which represents not-for-profit insurers, hasn't taken a side because it's waiting on specifics. America's Health Insurance Plans, the insurance industry's largest trade group, did not respond to requests for comment. The tax-free status of employer health benefits dates back to World War II, when the federal government imposed strict wage and price controls on Americans to control inflation and prevent changes that could disrupt the workforce. To get around those wage controls, employers began offering health benefits to employees as a form of untaxed compensation. The rest is history. Employer-sponsored health insurance became a standard offering. Employees now expect to receive health benefits. Businesses rely on good benefit packages to attract and retain the best talent. Not only that, employers are able to offer this tax-free benefit in lieu of raising employees' wages. Today, employer-provided insurance receives the single largest federal tax break, estimated at more than $250 billion in 2016, according to the Congressional Budget Office. Given that lofty figure, it's not hard to see why there have been many attempts to axe the tax break. President Ronald Reagan in 1983 proposed limiting the value of employee health benefits that could be considered tax-exempt, but that proposal was dropped when the Tax Reform Act of 1986 was passed. Just like today, the “tax cap” proposal was met with fierce opposition from employer groups and unions that feared any disruption to the status quo would erode the employer-sponsored benefit system. President George W. Bush in 2007 also sought to do away with the unlimited tax exclusion and provide everybody a standard deduction for health insurance. He argued that would encourage more people to join the individual market, which would bring premiums down. The Obama administration also considered shaking up the tax exclusion to pay for expanding coverage under his healthcare law. Ultimately, that didn't happen and the Affordable Care Act's “Cadillac” tax was born as a sort of middle ground. The Cadillac tax was supposed to go into effect in 2018 but was delayed until 2020 thanks to opposition from employer and labor groups. 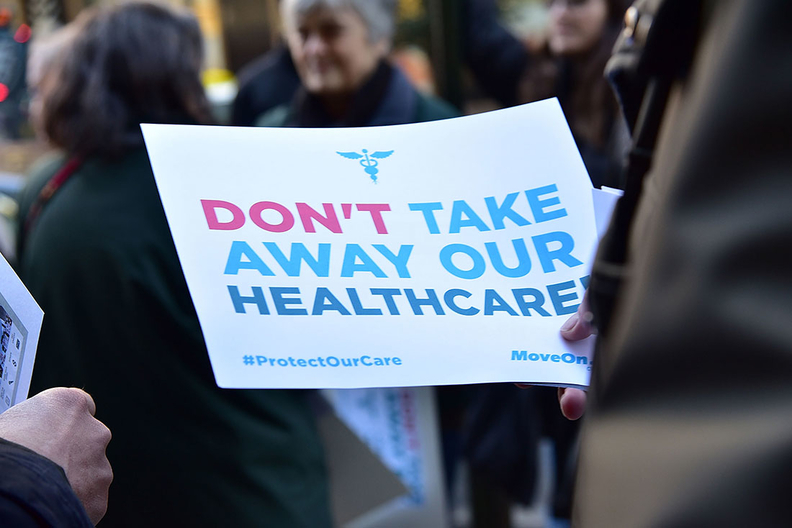 Groups such as the Alliance to Fight the 40 are still fighting to defeat the tax, but observers assume it will go away with the ACA. The revenue that would have been raised by the Cadillac tax could be replaced by capping the tax break on employer-provided health insurance. There's no shortage of support for a cap within the GOP: In his June paper, A Better Way, House Speaker Paul Ryan proposed capping the exclusion “at a level that would ensure job-based coverage continues unchanged for the vast majority of health insurance plans.” He argued the unlimited tax break holds down workers' wages and unfairly benefits the wealthy. The ACA replacement plan proposed by HHS Secretary Tom Price when he was a Georgia congressman—the Empowering Patients First Act—placed a tax exclusion cap at $8,000 for single coverage and $20,000 for family coverage. According to the GOP’s leaked draft of its ACA replacement bill, the cap on the tax exclusion would be the single source of revenue to fund the replacement plan. Republicans lawmakers say the draft is now outdated. Still, given the GOP support, it wouldn't be a surprise to see a change to the tax exclusion in the final plan. Details on the cap and how it will be implemented are still needed to assess its impact on employer-sponsored insurance. But if employers’ response to the leaked draft is any indication, the Trump administration can be sure that pushing the cap on the tax break through will be an uphill battle fraught with opposition. Employers aren't about to trade the Cadillac tax for a cap on the tax break. To employers, the two mechanisms are one and the same, Gelfand said, adding that lawmakers should expect “strong pushback from the employer community."